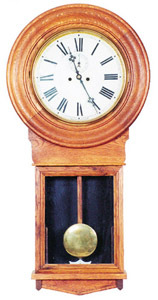 Waterbury Clock Co., "Regulator No.20", ca 1906. 8 day, double weight, time only. Dead beat escapement, retaining power, solid movement frames. 38 inch oak case in excellent original condition. 12 inch dial, label in the base, beat scale, original Waterbury flat weights that descend each side of the case. Good painted, signed dial. Ly-Waterbury No.560.